All-in-one (AIO) systems have been a hot topic in the cooler market for a while now. They bridge the gap between air coolers and custom water cooling loops by offering very respectable performance with simple plug and play installation. Lately more companies have been taking interest in AIOs and releasing their own versions which has spurred competition, causing the big players to really push the boundaries. Today we are taking a look at Thermaltake’s biggest, baddest cooler, the Water 3.0 Ultimate. 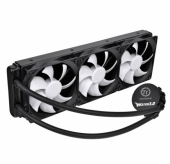 With 3 powerful 120mm fans bolted to a massive 360mm radiator and a higher flowing pump, this cooler could start to really close the performance gap between AIOs and custom loops while remaining user friendly. Read on to see how it performs.